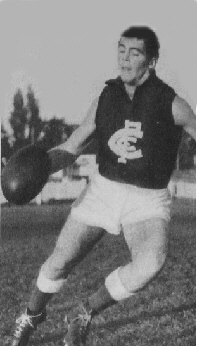 James Gregory (Greg) Hardie was recruited by the Blues from the northern Victorian town of Leitchville in 1963. A very young, yet already accomplished rover, Hardie represented the Blues in 24 senior games over three years, before somewhat prematurely returning to the bush in 1966. Carlton’s match committee thought highly of Hardie’s potential - so much so that they presented him with the number 15 guernsey previously worn by club legend Bruce Comben. Greg was still a month short of his 18th birthday when he was selected to make his debut in the senior side in round 1 of 1963, against Fitzroy at the Brunswick Street Oval. On that fine, cool Saturday afternoon he put in a lively performance, and kicked three goals as the Blues accounted for the Maroons by 23 points. A fortnight later, he kicked four goals against South Melbourne at the Lake Oval, and Carlton fans began speculating that the Blues just might have picked up a special talent. Although his form tapered off later in the season, he finished 1963 with a dozen games to his credit and a bright future ahead. As often happens to young players however, Hardie caught a dose of the second year staggers in 1964, not helped by Carlton’s overall poor performance that saw them tumble to tenth place on the ladder. Greg managed 9 games and 7 goals, and no doubt wondered what was to come when the news broke that Melbourne’s firebrand champion Ron Barassi had been appointed captain-coach of Carlton for the next five years. It is easy to imagine that Barassi’s intensity and rigid discipline took the fun out of the game for a homesick youngster who, up until that point, had made his way on skill alone. Barassi demanded more from everyone, so Hardie soon found himself a regular in the Reserves team. While Carlton climbed back to sixth in 1965, Greg managed only three senior games. He wasn’t selected again after sharing the roving duties with Adrian Gallagher in a 17-point loss to South Melbourne at Princes Park in round 14, and was delisted after the season by mutual consent. Back home in the Murray Valley, Hardie played a couple of seasons with Echuca, before accepting the role of captain-coach with North Wagga. In 1969-70, he won back-to-back Farrer League Best and Fairest as captain-coach of the Saints. In 1972 he moved on to Mildura in the Sunraysia League, and in 1978 – after more than 250 games at senior level in a career spanning 15 seasons - finally retired after his side Meringur lost to Nangiloc in the Grand Final of the cross-border Millewa League. 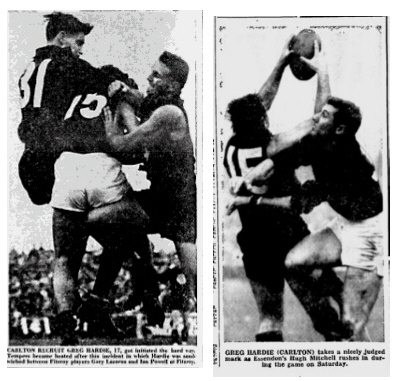 From The Age review of the Fitzroy vs Carlton match Round 1, 1963, Greg's debut game. "Tall follower Maurie Sankey was brilliant in the air for Carlton, and his good work was capped off by the grass-cutting passes of rover Bruce Williams. The Blues had a "find" in Leitchville recruit Greg Hardie, who filled the second roving berth with distinction and scored three goals. At the spearhead, Tom Carroll, marking and leading well, found fine first match form. He kicked four of Carlton's seven goals in the second term. With the rucks and attack and a dominant back line, the Blues had put the "writing on the wall" by posting a 49 point lead at half time. An angry third-term clash, which followed after Hardie, of Carlton, had been knocked down when marking near goal, was the turning point in Fitzroy's form." Contributors to this page: Jarusa , blueycarlton , pblue , Bombasheldon , PatsFitztrick , molsey , tmd1 , WillowBlue and admin . Page last modified on Wednesday 24 of May, 2017 15:02:18 AEST by Jarusa. 1980 Rd 1 Ashman & Percy Jones celebrate a big win over the Pies.